Dimensions:9.45" x 6.85" x 0.39"
PRECISE CUTOUTS:Compactable with Apple iPad 2，3，4 Generation (Model number included :A1395, A1396, A1397, A1395;A1416, A1430, A1403;A1458, A1459, A1460,you can find it at back of the iPad)Easy to access to charging port, buttons, speakers, front and rear camera. 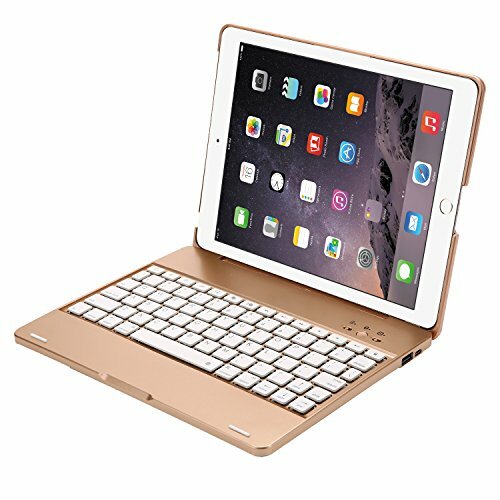 CLAMSHELL DESIGN:Folio bluetooth keyboard with a premium protective ABS Material hard shell design,which allow your iPad 2,iPad 3 or iPad 4 to be tilted up to 125 degree to provide more comfortable viewing position,transforming your ipad into a small MacBook. PORTABLE MOBILE POWER SUPPLY:2800 mAh battery generally applies in almost all mobile devices charged by USB.Well,it also could be used to recharge your ipad which is especially designed for the men or ladies outdoor,college,business carrying. SMART COVER:Auto Sleep /Wake Smart cover automatically wakes or puts your device to sleep.Easy operation and energy-saving.13 shortcut hotkeys make it easy to search, switch language, change volume on iPad, etc. FUNCTIONAL HOT KEYS: ABS keys give you a tactile response with every stroke,Bluetooth keyboard with familiar layout and iOS shortcuts for fast. If you have any questions about this product by YOUNGFUN, contact us by completing and submitting the form below. If you are looking for a specif part number, please include it with your message.